CBE deals with thousands of publishers and tens of thousands of books on a yearly basis, management of the system was getting harder as the company grew into new avenues of business. CBE had an outdated web presence and an unstable ordering process, thousands of orders each month took a toll on the staff and inconsistencies in the database caused a lot of inconvenience during large shows. The need of the hour was a system that automated everything, starting from the subscription, to tracking books, book placements, catalogue generation, payments, alerts on schedule changes and payment processing. In short the need was a complete automation solution that could streamline their large operation. A custom web based office automation suite makes it happen. We redesigned all 4 CBE websites and restuctured their database management systems, using the latest MySQL 5 we saved thousands of dollars in licensing costs and gave CBE unlimited scalability in their business processes. The software includes a custom subscription management system and a CRM that tracks the full circle from subscription to the process of procuring, transporting and exhibiting thousands of books, software’s, DVDs, Periodicals and Magazines. 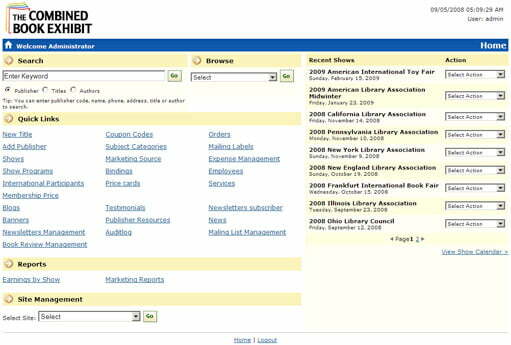 Every title entered into each fair is included in an online searchable database located on the Combined Book’s official website. Each database will contain the same information as the exhibit catalog (including pertinent title and company information) as well as images of each title. For each catalog and database, the included information is exactly as you want it to be, based on what you include when you fill out the registration form. The system is loved by the CBE team and we routinely assist them in enhancements to help expand the system into new areas of business. CBE now processes many times the number of orders from a few years ago and the process is seamless with no stress on the staff or inconsistencies in the show catalog. The system allows CBE to reach out to the publishers via a Newsletter management system, email alerts keeps everybody in the loop at all times. This has not only improved client confidence it has dramatically changed the company’s perception. This power of a versatile software has propelled CBE into several new avenues of business.